Item 9 Labs is a leading developer and manufacturer of innovative cannabis products and proprietary delivery platforms. Bryce Skalla, Co-Founder and CEO of Item 9 Labs. Item 9 Labs is ushering in a new era of wellness by developing innovative and comfortable health solutions for the modern cannabis consumer. We are cultivating quality-driven, organic products for whole body health, and seamlessly merging medical cannabis into a lifestyle. Item 9 Labs Corp. (OTC: INLB) (Item 9 Labs or the Company), a leading developer and manufacturer of innovative cannabis products and proprietary delivery platforms, today announced it has entered into a strategic partnership with VIRIDIS Group I9 Capital LLC (VIRIDIS), an Arizona-based investment company specializing in real estate and environmentally sustainable development. The partnership involves a USD $7.7 million investment by VIRIDIS Group, providing capital for the planned geographic expansion of Item 9 Labs, including medical cannabis cultivation and processing. The investment also supports the continued development of the Company’s enhanced cannabinoid delivery system, the first cannabis market medicated nasal delivery device administering cannabinoid specific dosing. The Company and VIRIDIS Group entered into a Loan and Revenue Participation Agreement on September 11, 2018. VIRIDIS Group agreed to make a secured loan USD $2.7 million represented by two separate notes: one for the construction and enhancement of the Company’s Arizona property, and the other for proposed ventures in Nevada. On October 17, 2018, the two companies entered into an equity Subscription Agreement. VIRIDIS Group agreed to purchase 100,000,000 (pre-split), or respectively 5,000,000 (post 1:20 reverse split) restricted common shares of Item 9 Labs for USD $5 million. Item 9 Labs will use VIRIDIS Group transaction proceeds to expand its manufacturing and revenues through the acquisition of real estate in Arizona and Nevada, as well as product development and general corporate purposes. Item 9 Labs is well-positioned to benefit from continued growth in the Cannabis sector due to changing regulations and the growing demands of a global industry. “At VIRIDIS Group, we pride ourselves on our forward-thinking and cutting-edge investment strategies and we view our investment in Item 9 Labs as an extremely valuable one, based on the Company’s rapid market penetration and established niche. We look forward to joining forces with this outstanding team,” stated Andrew Bowden, co-founder and CEO of VIRIDIS Group. The VIRIDIS Group investment is part of a broader strategy allowing Item 9 Labs to access the firm’s real estate expertise. VIRIDIS Group has additional interests in software, health, and fitness. VIRIDIS Group (VIRIDIS) is a family-owned Investment Company with experience in real estate investment and environmentally sustainable development as well as software, health and fitness. VIRIDIS prides itself in having an open-minded team and a diversified portfolio. An active equity company, VIRIDIS Group provides funding necessary to launch projects and an engaged team that is hands on with each venture on a daily basis. Item 9 Labs Corp. (OTC: INLB) creates comfortable cannabis health solutions for the modern consumer by developing innovative products and proprietary delivery platforms. The Company is focused on the development of technology and products that administer high-quality medical marijuana through a novel intra-nasal delivery system to deliver significant health benefits. 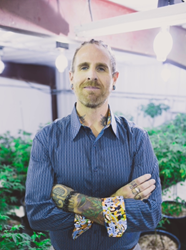 The Company is headquartered in Southern Arizona where it owns and operates 50 acres, one of the largest properties in the U.S. zoned to grow and cultivate the medical marijuana flower. Item 9 has a proven track record of providing consumers with high-quality medical marijuana flower and products focused on organic, cost-effective solutions for whole body health. By combining high-quality, medical-grade product with the Company’s proprietary nasal mucus-membrane delivery system, Item 9 plans to produce the industry’s first market medicated nasal delivery device that administers specific cannabinoid dosing to meet the growing demand of todays modern cannabis consumer. For more information, visit us online at http://www.Item9labscorp.com and http://www.Item9labs.com.